Being a member of the illustrious Teenage Mutant Ninja Turtles is an astounding accomplishment. Having undergone several years of training under the tutelage of a master ninja is something many of us should aspire to and learning it all from a rodent master who managed to learn everything, himself, by watching his own human master!? Who can hope to come near to that!? Of course, it is tough trying to be a fulltime ninja when you’re still pretty young. There are a ton of things that you’d be missing out on. Think of all the fun, the friends, the pizza! Fortunately, the TMNT squad is a strong and solid family and the quartet manages to work together to give them all a healthy dose of every aspect of growing up. And, Raphael is obviously the most important of the brothers. Without him, how would anything get done? Aggressive and ready to knock some skulls together whenever the Foot Clan are ready to cause problems, you can trust that Raphael is going to be in the front line with his sai blades! And, it is time for your tot to get some of that same training as a pre-teen mutant ninja turtle. 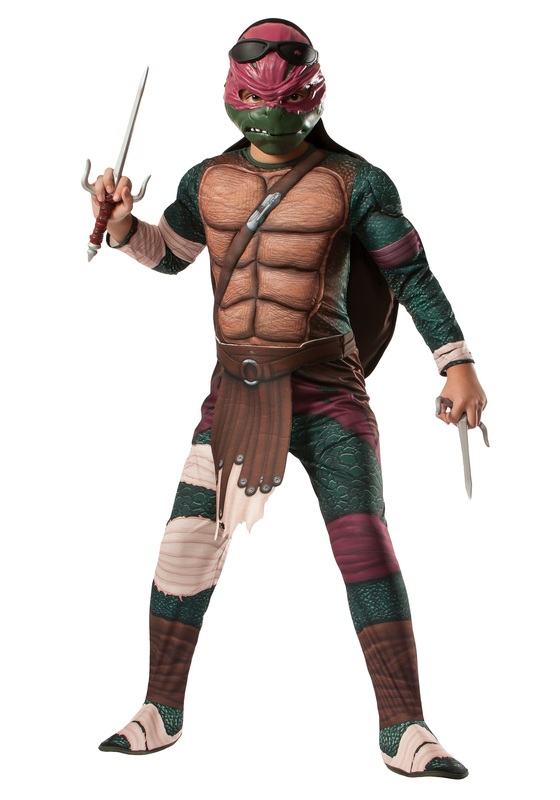 And your kiddo can skip some of that rat training, too, with this Ninja Turtle Movie Child Deluxe Raphael costume. The polyester jumpsuit is comfortable and has Velcro in the back to attach the foam-backed shell which can be stuffed for a profound 3D effect! Fiberfill stuffing helps to bulk up some otherwise developing muscles and the molded plastic mask helps to give your tyke the mutant powers that they’ll need without having to actually swim around in some toxic waste. Officially licensed, you and your kiddo are ready to tackle your training and all the threats Halloween has to offer… though, you might consider a plastic weapon, too, just in case. The costume was one of my child's favorite gifts. It was made well and true to size.